I tried to warn Peyton Limberakis that I'm no food critic, but he didn't want to listen. When I went to visit Limberakis at The Mad Greek on South Boulevard, I told him I was there to tell the story of the restaurant, not to review the food. 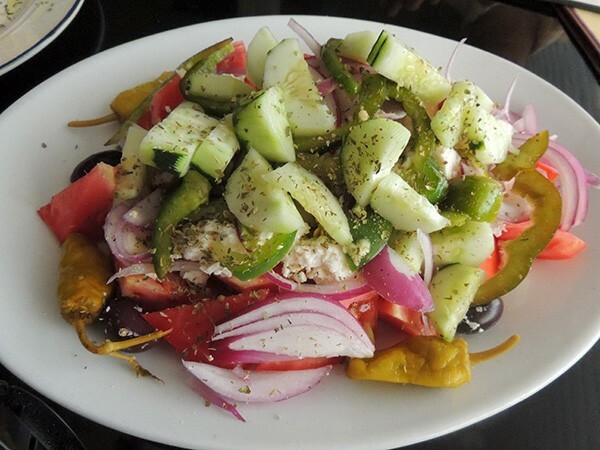 The village “xopiatikh” salad is a good place to start. Nevertheless, five minutes into our interview, the food arrived. Suddenly and unsolicited, from the kitchen came a huge village salad, heaped with cucumbers, pepperoncini, tomatoes, olives, feta and more; followed by some pastichio, a Greek version of lasagna made with buchini and béchamel sauce; then spanakopita, a flaky spinach pie; and finally, what had grabbed my attention when I first came to The Mad Greek months ago, the gyro, piled with lamb meat that was somehow both crispy around the edges and succulent upon chewing. It was around that time that I came to a realization: I need to write food stories more often. I met Limberakis at The Mad Greek at about 4:15 p.m., just after the group of Greek guys who hang out on the patio daily playing games like backgammon had left. Limberakis had come straight from his day job to begin his secondary gig, helping around the family business, as he does almost every day. One would think a 25-year-old like Limberakis would be rolling his eyes at the thought of coming straight in to work after a full day as a consultant with Wells Fargo just to schlep around the restaurant for his family and make $2.50 an hour. That's not the case. Peyton couldn't be more excited to be working at the restaurant, and it's no front he puts on for a visiting journalist. During my visit, Peyton's father Chris Limberakis, the restaurant's owner, was out of town, making his annual visit to Greece, and Peyton was running things on his behalf. Peyton Limberakis at The Mad Greek. "I love running the place when my dad's gone," Peyton said, his sincere enthusiasm impossible to hide. "It's so much fun to do the scheduling. I get to help train. I love waiting tables. I get to tell my story. People know me from when I was little. They say, 'Oh, you're still here?' Yeah, I am. I love it." It's no exaggeration to say that Limberakis has spent his life in the restaurant. On October 31, 1991, his father opened Hugo's Diner on South Boulevard between Woodlawn and Tyvola roads (dare we say LoSo?). Just 22 days later, Peyton was born. The diner, named after the infamous hurricane that roared through the city two years before, was painted in Hornets colors to pay homage to the basketball team's mascot. Limberakis remembers being shocked as a child to look up from a table he was playing under to see star point guard Muggsy Bogues standing at the bar. He recalls his sister Amelia, now 18, shadowing his mother around the restaurant with a little notepad at 2 years old, taking orders right alongside her. Now, a generation later, the two are still at it. They've got uncles and cousins and in-laws working there, too. When I asked Limberakis if it ever gets tiresome working with family day in and day out, he tells me a story that shows his sister's enthusiasm for the business is still as unbridled as his. "Amelia can be difficult when she wants to do the schedule, because she wants to work every day," Limberakis said. "She's off school now, so she said, 'I can get up here.' I said, 'We have other people that need to work, this is their only job. It has to be fair.' One time she hit me up top of the head, she got mad. But it's fine. The joy we get out of it; we have a restaurant, that's exciting." Limberakis said he expects he'll take over the family business when his father has had his fill of running the place, but 10 years ago, it didn't look like that future was in the cards for the Limberakises. In 2007, Chris Limberakis shut down Hugo's and leased the building out to some other aspiring restaurateurs. He went to Greece that year and fell back in love with his native cuisine. Upon his return, it became clear to him that United Nations, the restaurant that had opened in his old diner space, would be disbanding soon. Chris reluctantly re-opened the restaurant as The Mad Greek, channeling his anger about all the missing rent payments from his former tenants and his newfound love of Greek fare into a new restaurant concept (he's not still mad, and you'll get nothing but smiles when you walk through the door). A fire that started in the deep fryer shortly thereafter brought about a remodeling, which Peyton says reinvigorated his father. They changed the color scheme from the orange and red of United Nations to an aqua blue, with murals of Greece both inside and out. "Between him going to Greece and then the remodeling, the revamping, that was when he said, 'OK, let's get this thing going,'" Peyton said. 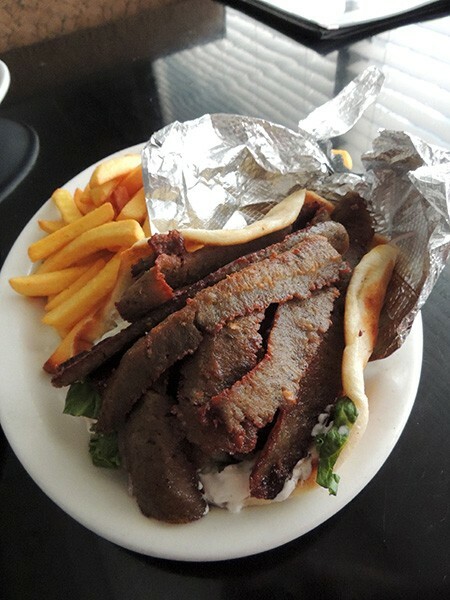 The Mad Greek's most well-known dish, the gyro. 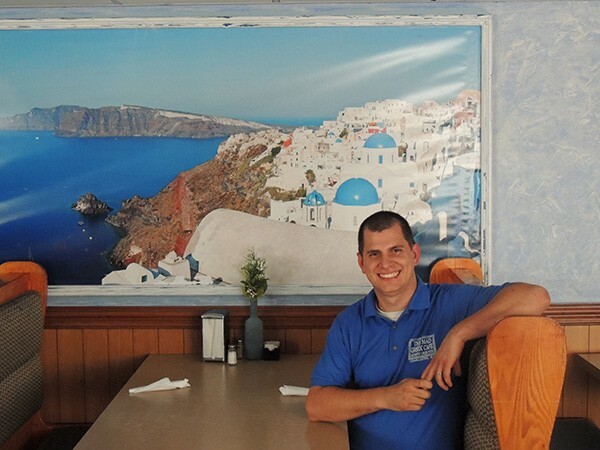 Chris and his brother George, a co-owner of The Mad Greek, began cooking up their takes on Greek classics like those mentioned above, while still keeping some Hugo's favorites in rotation. Nostalgic diner customers can still find their favorite hoagies or breakfast classics like livermush and eggs. As for Peyton's favorite, he stands by the gyros and knows they're great, but he's moved on over the years. Now he sticks with the chicken souvlaki, served on a skewer over a bed of rice, peppers and onions. "The gyro is the favorite, most definitely, we're most famous for that," he said. "But the chicken souvlaki, I say that's my favorite because I've had the gyro for so many years. If you're not ready to dive in, then get the gyro, but the chicken souvlaki is such a nice, filling meal. If you're ready to go to sleep after, that's a good meal." And if customers still can't make up their minds, the Limberakises recently added a "Tour of Greece" to the menu, in which customers get a sampler of Greek classics including grape leaves, spanakopita, moussaka and pastichio. Follow that up with some galaktobouteko (we can tell you that it's an amazing egg custard dessert, but we can't tell you how to say it) or baklava that's made fresh every day. If you weren't ready to go to sleep before, you will be now. The Mad Greek has been a hit among newcomers and Hugo Diner hangers-on alike. Couples like Grady and Carol, whom Peyton has known from the restaurant since his days as a child, returned and rekindled their friendship with him and his family. A man began coming in and sitting at the bar, just interested in a small order of hummus and a cup of tea. He still comes in nearly every day, Peyton said. While the repeat customers are great — whether playing board games on the patio or just eating their hummus alone — Peyton has taken it upon himself to modernize the restaurant's marketing strategy, recently taking to social media to recruit younger generations of customers. According to him, it's gotten a response. "Absolutely, it's been working," Peyton said. "I'm seeing that the Facebook is working. We have people saying, 'Oh, can I have the spanakopita? I saw it on Instagram.'" With efforts like those, Peyton Limberakis is setting himself up for another 25 years in the diner he was basically born in, and with the ever-present passion he clearly has for the job, it should be smooth sailing. He just has to make sure he gets his sister the hours she wants and he'll be fine.